Fiddlehead ferns are one of spring’s most elusive goodies. The are available for about three weeks in May (as in right this second), and are generally harvested in the northeastern United States. A fiddlehead is the tip of an unfurling Ostrich Fern frond, quickly snapped off with the flick of the wrist by professional foragers in the wild. If you see some growing in the woods near you, take care. There are many other ferns that resemble the Ostrich Fern, some of which are considered to be carcinogenic, like the Bracken Fern. Unless you have a guide with you, leave the collecting to the professionals and pick some up at Whole Foods. They cost $6 a pound in Boston. Their flavor is mild, and perhaps most closely resembles asparagus, and asparagus is the best substitute for the ferns. Some also say they are similar to green beans and artichokes. They are pleasently crunchy with a nutty, slightly bitter bite, which is why you’ll see so many fiddlehead recipes calling for butter and salt. 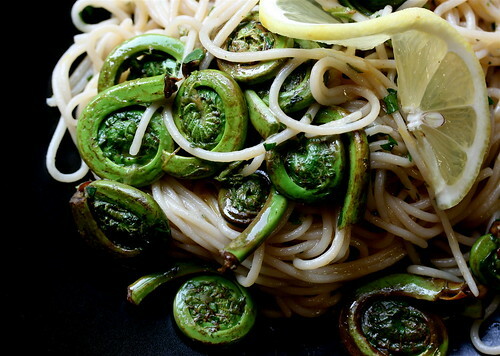 Treat the fiddleheads like asparagus tips and you can’t go wrong. If you really want a treat, serve them up with some morel mushrooms; their season coincides almost exactly with the ferns and they pair well. There are a few things you need to know about preparing fiddleheads. Most importantly, eat them immeditely. Fiddleheads do not keep well, so you should try to use them the same day you buy them. You can keep them covered for a few days in the fridge, but their flavor diminishes quickly and they will spoil soon after that. Do yourself a favor and eat them as soon as possible. To prep the fiddleheads, any leftover “silk” should be removed. The silk is a thin, brown, papery covering that resembles a peanut casing. Most of this is taken off before distributors put them up for sale, but there are always remnants that need to be removed. You can rub it off with your fingers; I prefer to do it in a bath of cold water. Rinse them in a bowl, gently agitating them with your fingers and pouring off the water until it is free of particles. Drain well and pat dry. People argue about how you’re supposed to cook fiddleheads. Health officials recommend that you boil them for 15 minutes or steam for 10-12 before eating. Why? Because fiddleheads have been associated with certain unpleasant G.I. sicknesses. However, the same article references three sources that claim that Ostrich Fern fiddleheads are safe to eat in any state, raw or cooked. Personally, I have always lightly cooked my fiddleheads and I have never had an issue. If I had to boil them for 15 minutes to eat them, I wouldn’t eat them at all! 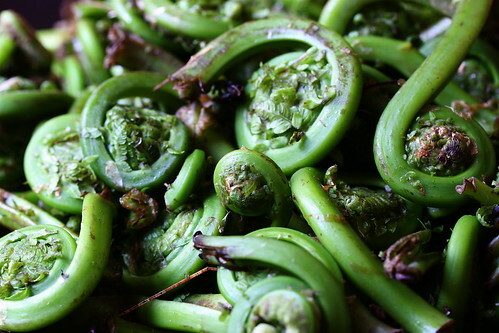 The delight of fiddleheads is their delicate taste and toothsome crunch – boiling them for that long would destroy all that I love about this tender green. You should do whatever makes you feel comfortable. Picking fiddleheads is a family tradition here in Maine. We are fortunate to pick them right here on our own property. We steam our fiddleheads in either bacon or salt pork to bring out the flavor wtih kosher salt and freshly grated pepper. Drain and drizzle with champagne vinegar and butter more salt and pepper and serve steaming hot. Some of our other favorite ways to serve them are iin a quiche, cream of fiddlehead soup and a spring fiddlehead puff whiich is my favorite way to serve them ~ here’s the recipe: toast 6 homemade bread slices on one side in broiler. Place slices of cheddar cheese on each untoasted side. Broil to partially melt cheese. Place some hot cooked fiddleheads on top of cheese. Beat 3 egg yolks until thick. Stir in 1/4 cup of mayonaise, a dollop of djon mustard and some kosher salt and pepper to taste. Fold in 3 beaten egg whites. Pile on top of fiddleheads. Bake 350 oven about 12 minutes. I grew up slogging through the mud and creek beds looking for these scrumptious delicacies in northeastern NY state. Now, transplated to Washington, DC…I am forlorn and lonely for my favorite veggie. I’ll pay if somebody can tell me where to go picking in the Maryland region. Neither my husband or I had ever enjoyed fiddleheads so we purchased some at Whole Foods. The sign said to either steam or saute then serve with olive oil and lemon. So we sauted them. My husband was fine but within several hours I was VERY sick, which continued all night. I have no allergies and can’t imagine why they did not agree with me. I enjoy all types of food and although they tasted very good, I won’t be eating them again any time soon. 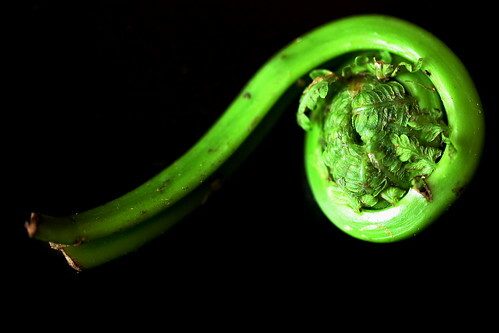 April 28, 2011 - 3:07 am Pingback: Fiddleheads « I'll Make It Myself!